One thing that I have been very diligent about in my 6 years in this hobby is authenticity. That encompasses a lot of things. Provenance, screen capping, research. 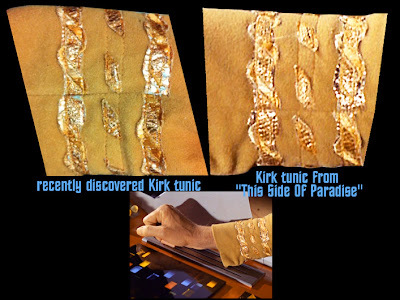 And this is very important as lately there have been some unscrupulous attempts to both prove and disprove the authenticity of Star Trek items. At the core of every attempt at authentication is a level of integrity and commitment to the hobby. Your personal gain, whether monetary or otherwise, is irrelevant to the process. And I would say, that if you have self interest in the outcome, you have to set an even higher standard. So in this article, I will first cover the basics of authentication. Next article I will deal with ethics and integrity. The final article will be the most recent example of how this is done right and done wrong. Sometimes it is easy to prove something is what is claimed. You may have a COA from It's a Wrap or an invoice from Christies (remember there were no COAs from Christies). 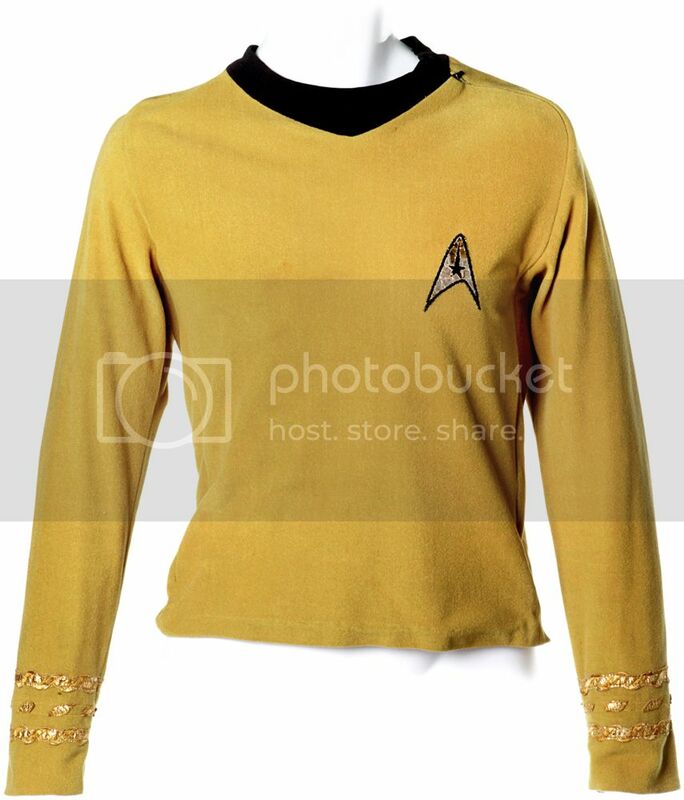 We know those are the two studio sources for Star Trek props & costumes and that tells you the item is authentic. 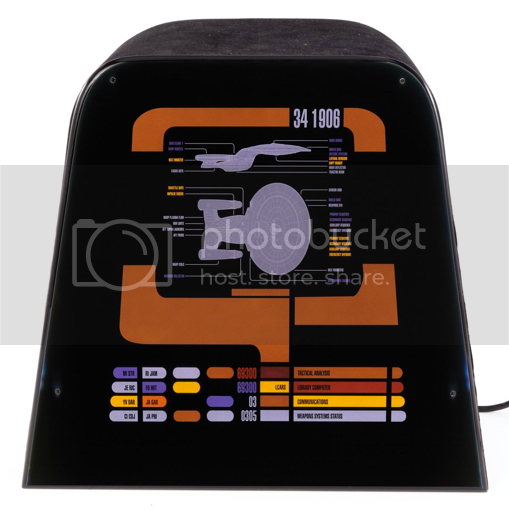 Propworx has sold items from Doug Drexler, Mike Okuda, Rick Sternbach and other Star Trek crew (as well as items that have come on the secondary market - meaning resales of Christie's and IAW items). So that is a great source you can trust as well. But what happens when you get an item that is not from these sources? I would put everything in any other auction in this category. How do you know it is real? Now, everyone knows I give ZERO credibility to a COA. I don't care if it is from Profiles in History, who we know has been sloppy with their authentications from time to time, or The Prop Store, who I trust and heck, Jarrod Hunt, my former Propworx right hand man works there now and I know he is meticulous as I trained him! But both these companies have made mistakes. Now these mistakes are not intentional, as they each have limitations they have to deal with. Profiles has 1,000+ items in each catalog and they simply don't have the time to do the proper work on each item, so they often just take the consignors word. This is where you most need to be careful. And The Prop Store is generally very very good, but from time to time things have gotten through as happens with any company that deals in props. Still, even with a company as good as The Prop Store, I always do my own homework. Now, getting a refund if something turns out to be fake is not an issue with The Prop Store. They are honorable people who stand behind their sales. Profiles I have no experience with their return policy, but I did have a good dealing with Brian Chanes recently, that I will describe in my next article. We were trying to get more info on an item I won. He was very helpful, and knew that I have very high standards when proving an item is real. I have no doubt that if the item had turned out to be fake, he would have refunded my money. So remember, you have to be careful with COAs. 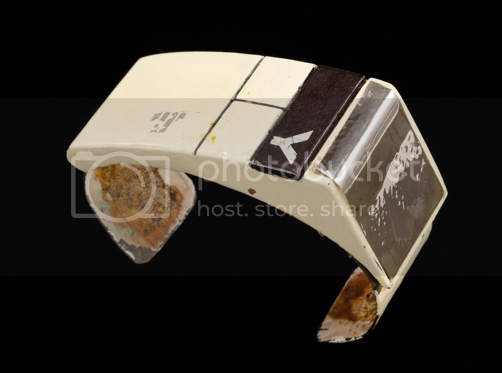 Screen matching remains the best way to prove an item that is not from Christie's, IAW or Propworx, is in fact real. This is actually a terribly fun process that I have spent hours on for individual props and costumes. 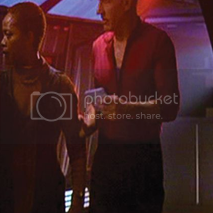 Screen matching is simply the process of looking closely at screen captures (screen caps) of Star Trek episodes and movies and finding specific marks and clues from an item on screen and comparing them to the item in question. Screen matching doesn't lie, but I have seen situations where one person has seen something that another does not. So you have to come up with REALLY good distinguishing marks. Provenance is simply the history of an item. Can you track an item through who owned it back to the studio? Sometimes, with items from Christie's or IAW, the Provenenance is clear, it comes directly from the Studio! 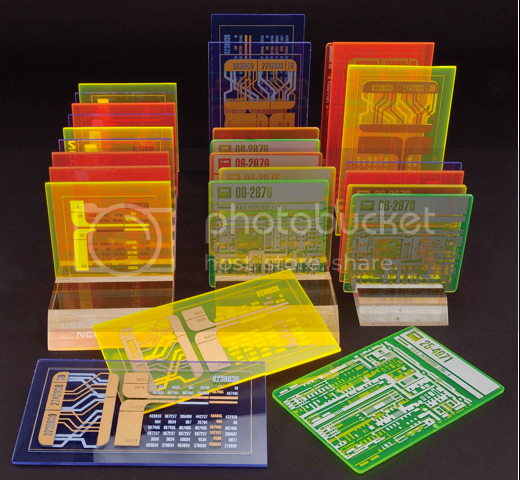 With Propworx items, the provenance is usually that it comes from someone who worked on Star Trek. But what about other items? Well, usually you don't know. Sometimes you can work with the seller and find out who the item came from. But often people want to keep that secret. In fact often people will lie about it. Why? Because often the items went out the back door of the studio. In the big Profiles auction in 2010, most of the items were from one consignor. Now he had told me directly that he had a friend who worked at Paramount who would sell him stuff out the back door. And he had bought a LOT of stuff. Well, when he went to sell it, the story became he had found a storage unit full of the stuff. So how do you know? Many people asked me if it was OK to buy these items, since they were effectively stolen property. In this case I had called my contacts at both Paramount and CBS who said that they would not pursue anyone buying items that didn't have legitimate Paramount provenance. This effectively legitimized the items. And while Profiles was upset I called the items "stolen" there was no question they were, but my efforts allowed people to buy the items knowing that title was good. 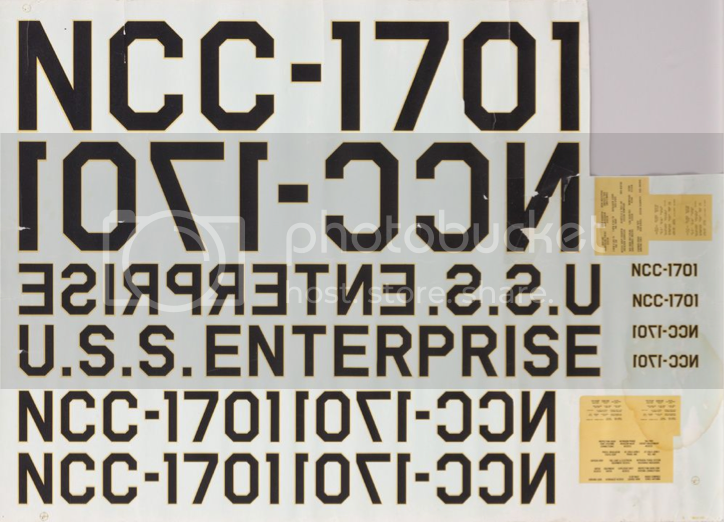 So provenance is a both the best way to identify a Star Trek item, as there are over 10,000 Christies and IAW items out there, and sometimes difficult if NOT from one of those two sources. So, those are the basics. Next article will be about the ethics and how integrity is being compromised in the hobby. 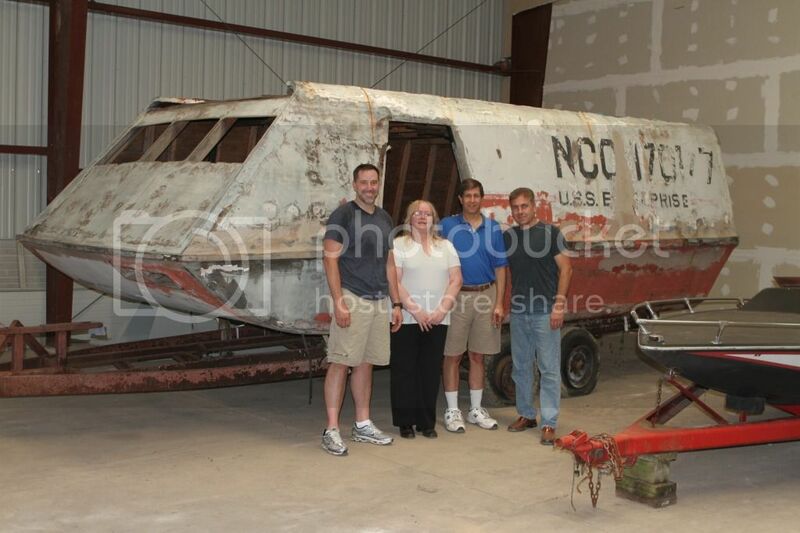 As many of you know, Adam Schneider and I acquired the Galileo shuttlecraft full size set from the original Star Trek this past June in at auction. So I thought I would give a little history of the project and where it is going. In June of 2010 I started hunting for the Galileo after reading a thread on a forum about it. My good friend Steve Thomas knew the parties who were the restorers and the last known owner of it. I asked Steve to make inquiries into it and see if we could find it. Unfortunately, the owner had disappeared and the last know location of the Galileo had been sold and the Galileo moved or destroyed. As I am a regular blogger for StarTrek.com, the official CBS Star Trek website, I got these articles of Steve's published there last year when we were still looking for the old girl. And here is an article on the restoration Lynn Miller undertook with the help of Bill Krause and his crew from the Star Trek fan club USS Lagrange. So when Lynn resurfaced with the Galileo and posted her intent to sell it, I started a dialog with her. A lot of fan groups wanted to get her, but Propworx and my role with the CBS Star Trek archive let Lynn know we had the ability to restore the Galileo the right way. Adam Schneider, who is one of the biggest collectors of Star Trek screen-used filming miniatures called me and said "What do we need to do to save her?" Adam, like I, strongly feels that Galileo is a piece of history and needs to be preserved. And Adam has the ability and connections to do this the right way. So we made an offer to Lynn, but she wanted to go the auction route and did. 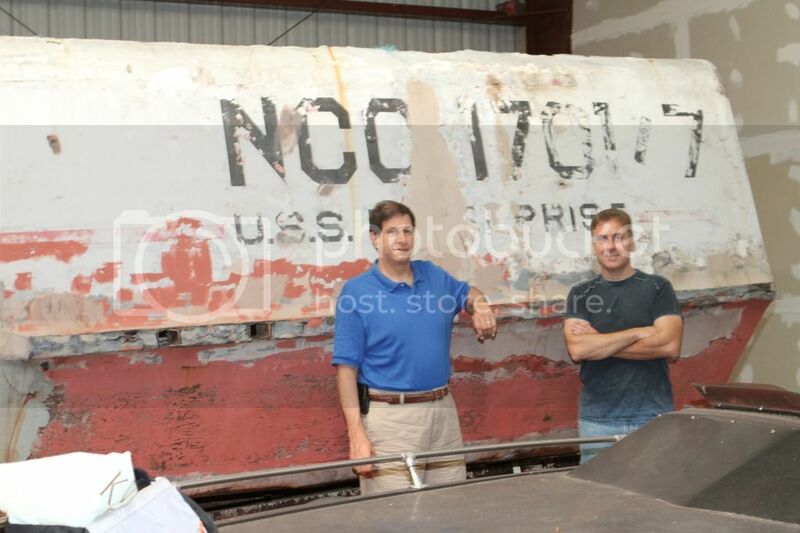 Adam and I won it at auction and began the process of looking for restoration facilities and museums. The idea is for us to restore it to its full glory and then donate it to a museum for all fans to see. Adam has great connections with the two biggest museums we are thinking of donating it to, and we have hunted down a few others as well (more on this later). A lot of my effort has been to getting the word out and getting Trek luminaries involved. Doug Drexler, Mike Okuda and John Eaves have all attached their names to the project. I sold both Doug and Mike's collections so they were only a phone call away. John Eaves, who I am a huge fan of, called me up and said he wanted to do whatever we needed to help. And then, after we moved all of the Galileo parts to its new storage facility, I got the contact info for Gene Winfield, legendary hot rod customizer and builder of the Galileo. He is located 2 hours north of me in Mojave, CA. So on my way to the Las Vegas Star Trek convention (The world's biggest Star Trek convention where Adam and I were speaking on Galileo) I stopped by and saw Gene. he was totally excited that we won the Galileo and committed to do anything he could to help. He even still had the molds for the seats they used as well as other parts we will need to refurbish her. So that is where we are at the moment. Adam has been doing all the leg work on where to restore Galileo and it is on the move to a shop that will bring it back to its original condition that is near Adam. Star Trek: First Contact was the high point for the Next Gen series of features. It had a lot going for it, including plenty of action, our favorite villains, humor, and one of the great historical Trek characters, Zefram Cochran. One of my favorite moments, is when the ever enthusiastic Geordi LaForge gushes to Cochran about his statue, which will one day tower over the site they are standing on. While working on the color version of the Star Trek Encyclopedia with Mike and Denise, it occurred to me what a cool thing it would be to include a picture of Cochran’s statue. M & D enthusiastically agreed, and I went directly to the art supply on Laurel Canyon, picked up an armature, some roma plastilina, and got to work. By the end of the day, there it stood. I had based it on Levar’s descriptive pose, and added some plans to the crook of Cochrans arm. The final touch was to adapt Picard’s distinctive two finger “engage!” point, as if our erstwhile captain was invoking this very statue each time he gave the order for the great starship to go to warp. Fast forward to “Enterprise”. Right there in the series bible, it says that the ship’s captain, Jonathan Archer, idolizes Zefram Cochran. What a great bit of set dressing for Archer’s quarters the sculpture would make. I packed it in my bag, brought it with me to Paramount the next day, and set it prominently on top of my computer monitor. I’ve learned a lesson working with strong willed, and independent creative people. Never push an idea, let them come to it themselves. Jimmy Mees, our brilliant set decorator was one of those guys. So I bided my time. I knew that on the day Rick Berman inspected the dressed sets, Jimmy would rush into the office wide eyed, looking for appropriate, and last minute set dressing. 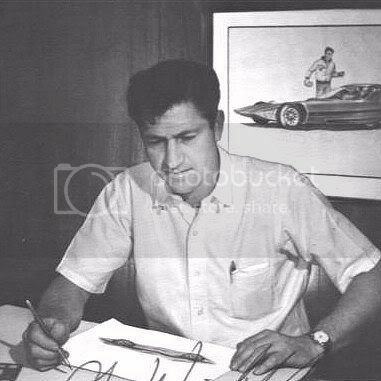 On the day, my buddy Jim Vanover, ace Okudagram animator said, “hey Dougie, why don’t you give the Cochy to Jimmy Mees for Archer’s quarters?” I smiled, looked at my watch, and counted down, “3…2…1.” The door to the office banged open, and there stood Mr. Mees with that hunter’s look. His eyes darted around the office in search of prey. “I need last minute, inspired, additional set dressing for Archer’s quarters! Make it quick, ’cause Berman is on his way over to stage 8!” “Hmmmmmm…” I said, raising my arm and pointing at nothing in particular. Jimmy’s eyes snapped to where I indicated. “What? Where?” Playing it for maximum drama, I slowly rotated a full 360, pointing all the way. Jimmy’s head followed like a dog glued to a treat. “Could you … use… a statue… of ARCHER’S… HERO…….. PERHAPS?” My pointing finger came to rest on the sculpture. Jimmy eyes popped out of their sockets. “PERFECT! GENIUS!” he snatched up the Cochy and made for the stage, leaving behind a cloud of dust. Vanover looked at me with admiration. “You’re good!” He said. I have to admit I was under-bidder on this and would have loved to add this to my collection. But I bid $ 4,500 and was out bid, and I just didn't feel this was worth the $ 6,000 price it would cost me to win this. As it is it closed at $ 4,750, which, when you add the BP, comes to $ 5,842.50. Now, admittedly, these aren't common, so maybe I was just being cheap. but I had already won one item, and so I was content to let this go. Well, no surprise that the world's biggest Ferengi collector, Francis, won this! And it couldn't go to a better home. At $ 4,920 it is a bit high, but it does come on a full mannequin. And Francis seemed very happy to have won this particular costume. 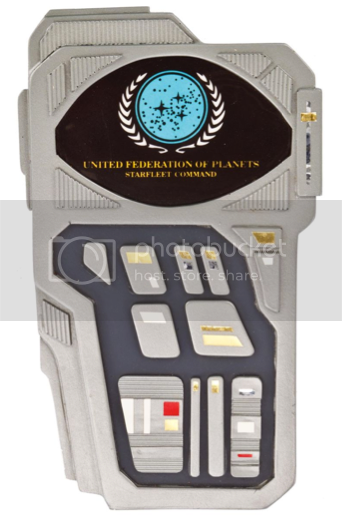 The Federation PADD at $ 799.50 is strong for a pretty bland one. These things are a dime a dozen and there were hundreds of these made. I think you pay no more than $ 600 for these. I am surprised at the Cardassian PADD, which is tiny! going for $ 1,107. That is way high. It is 4" tall! I have to say that at $ 3,997.50 I find this high for a static, non functioning Tricorder. Pretty basic piece and there have been a lot or Tricorders lately. I think this is an average price for a functioning one. This is a good price for a rare prop. 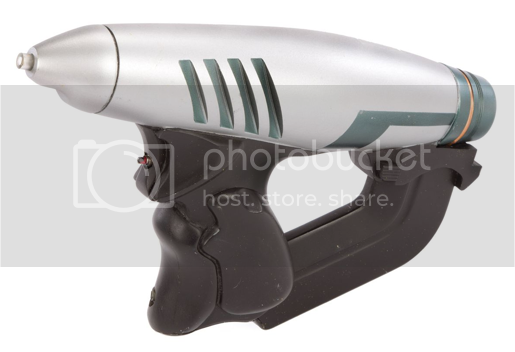 I have seen this prop and we just don't see that many working, non-Federation Tricorders. A good prop at a good price. This was actually noted as missing the barrel cover and I give Profiles credit for noting this. 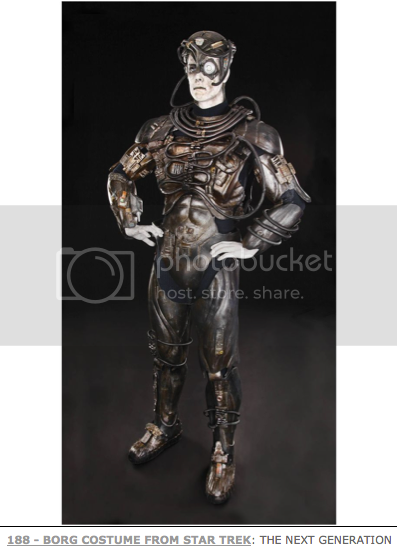 Used by both the Jem'Hadar and other alien races, this piece was pretty fairly priced at $ 922.50. 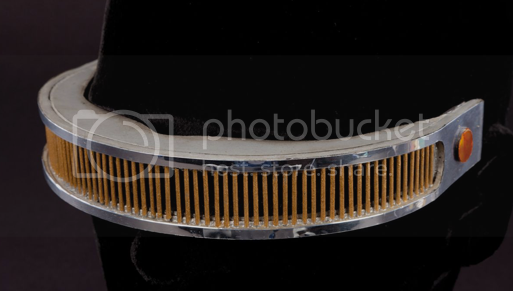 Well, this is about what one would expect for a Gerodi VISOR, which is one of the truly iconic pieces from TNG. I am thinking I need to add one of these to my collection, but still a chunk of change! But well displayed here by Profiles. My buddy Gary won this for his amazing Star Trek media room. 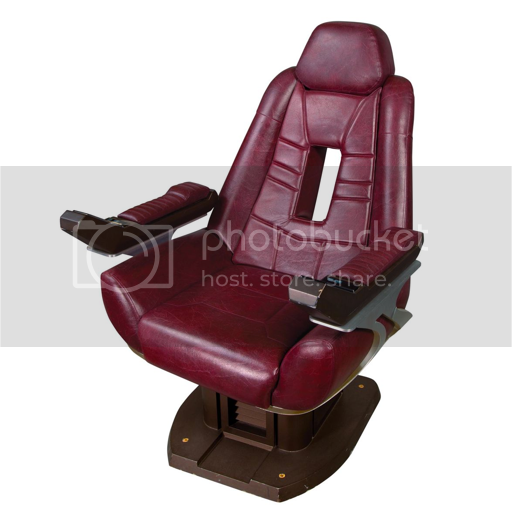 He formerly had Captain Archer's chair and wanted to update it as he also has the Enterprise E helm and nav consoles. 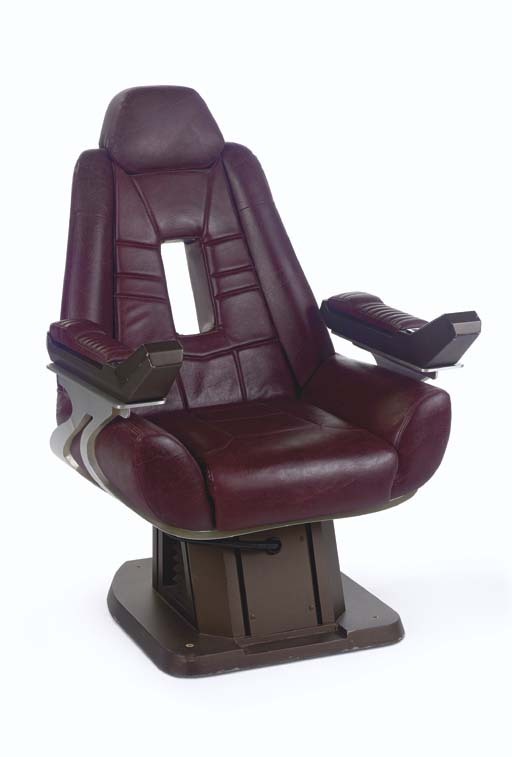 I can't say that this is either expensive, nor reasonable, but it is one of two Enterprise E chairs in circulation (another got stolen and who knows where that is!). So I think it is market price! This costume has both the under-girdle/corset and a tricorder holster. It sold for $ 13,530. (11,000.00 + 2,530.00 BP), showing that Seven of Nine costumes are as strong as Captain's costumes! This is one of the nicer ones in that it is two-tone and Profiles did a good job displaying it on a mannequin, which you have to do if you own a 7 of 9 costume. Most Federation costumes look great just on a form and costumer (the way Christie's and Propworx have done it). 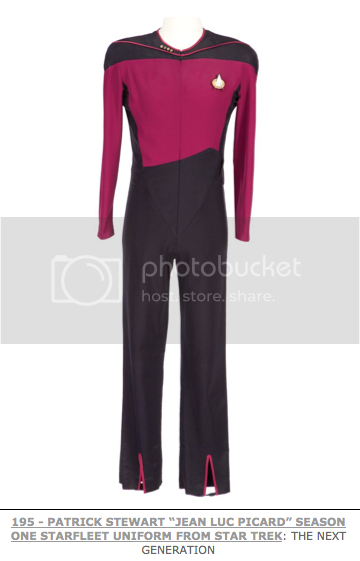 But a slinky catsuit needs to be displayed on a full female mannequin. ARE YOU FREAKING KIDDING ME? What two people thought this PADD was worth over $ 3,000? At $ 3,382.50, this non-hero PADD has to be the most overpriced PADD ever sold. Certainly one of the most expensive. 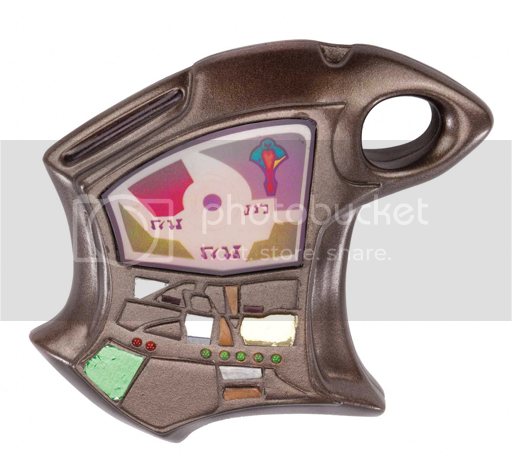 And it is a re-purposed Cardassian PADD! It doesn't even look like a Federation PADD. Now, I will tell you I bid $ 1,000 on this because of its distinctiveness, but two people thought it was worth a lot more and I have no clue why! And the screen cap Profiles provided is 100% WRONG. WTF they put a bad screencap in is beyond me, but this is almost fraudulent. 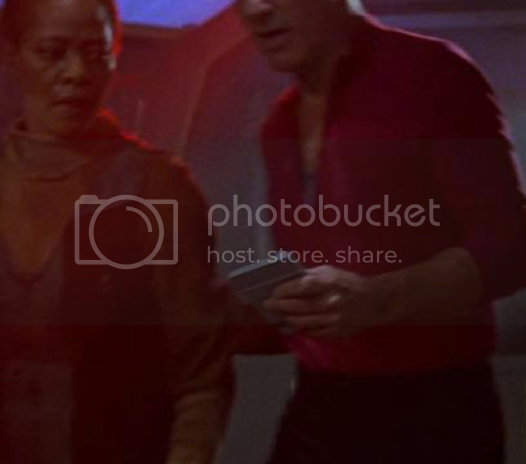 That is NOT the right screencap, and Picard DID NOT use this PADD. Trekcore is the definitive source for HD screencaps and so there is no excuse for this sloppiness. Go here to see the HD screencap of this image and see it is NOT what Profiles claims. This is CLEARLY not the PADD offered by Profiles in this lot. There were a LOT of these made for First Contact. But I find it interesting that Profiles has more detailed information on this one and would love to have found out more. A very cool piece, but I think on the high side because there are so many of them. 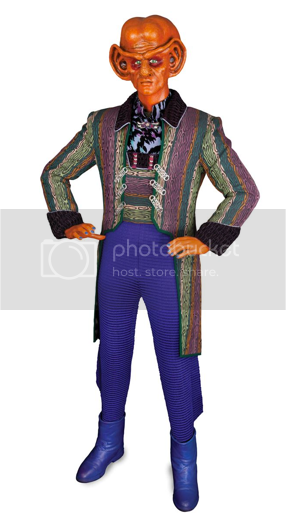 Can't argue with this price and we see good captain's costume holding strong and even moving up a bit. I bought my Archer (The "These are the Voyages" version) for $ 5,000 and that is where Archer's have traded up till now. This is a good price and means quality is still strong in Enterprise costumes. What I love about this is it includes both pips and a comm badge, which sadly, most It's a Wrap costumes never did. Strong at $ 8,610, this goes to show Data's enduring appeal. Plus this is a great looking costume. Well, there you go! More coming tomorrow! I am going to cover the weapons in this article. 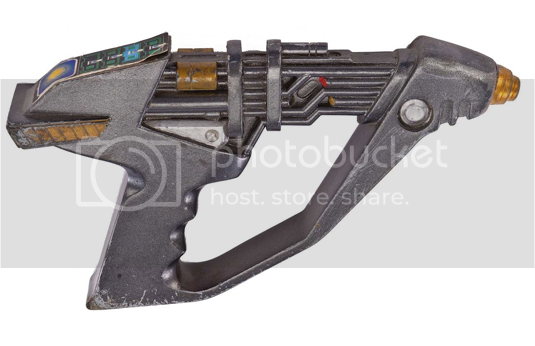 There were 16 weapons (2 of which were the Klingon Bat'Leth and Mek'Leth) and thus 14 phaser weapons. Sadly for me, very few were Federation weapons. Prices have settled into a very predictable range, with generic props going in the $ 700-800 range, known races in the $ 1,000-1,200 range and hero weapons in the $ 1,500-2,000 range. Note this is for ALIEN races and not Federation phasers, which of course, go higher. I note all prices WITH the Buyer's Premium (23%). 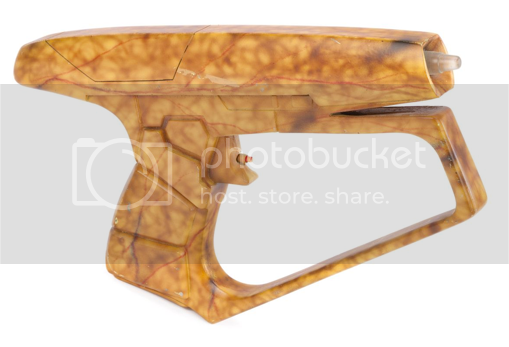 Lot 223 Static EVA Phaser Rifle from "First Contact"
There have been a few of these out there, and I paid $ 5,000 for my hero, which is about right for hero versions. At $ 3,997.50 this is fair as it is much rarer than the standard Type II phasers. Plus it is just damn cool! At $ 1,045.50, this is a good deal. If you collect alien phaser weapons, then I think you start with the major races...Klingons and Romulans. So this is an important piece, and used throughout TNG through Voyager. Labeled a "Hero" as there were no working versions of these rifles. They are pretty darn nice as I own one and they are very beautifully painted. 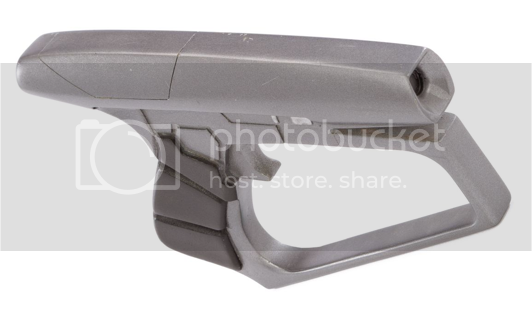 Of course, to be a Romulan completist, you will need to also get the "V" version of rifle used in TNG. At $ 1,168.50 this was right around the $ 1,200 these usually go for. I love this weapon and have one. 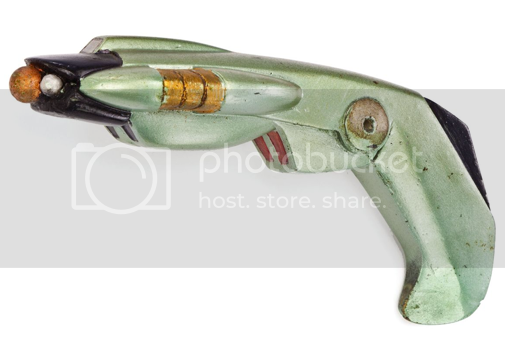 There were no working versions of this pistol, just resin and rubber versions. Very reasonable at $ 1,107. I collect all the DS9 alien races and so have costumes and props from these races. Each costume has matching weapons, both pistol and rifle versions. Building your collection like this is a great way to create a theme that tells a story. This is said to be Quark's, but it is not clear WHY Profiles makes this claim. 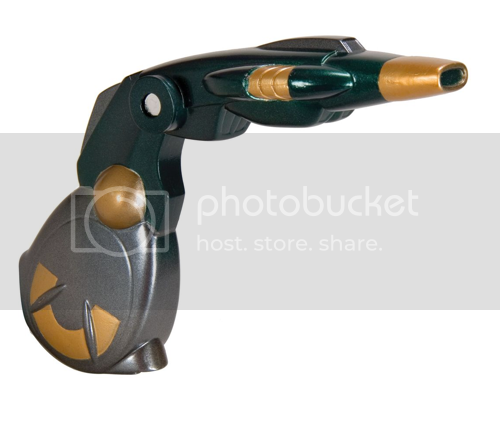 Yes, they show a photo of Quark using a weapon like this, but is it screen matched? The Profiles photo is the reverse angle of the screen cap and so you can't tell. I have had this issue before with Profiles. They claim items are used by specific characters without proof. 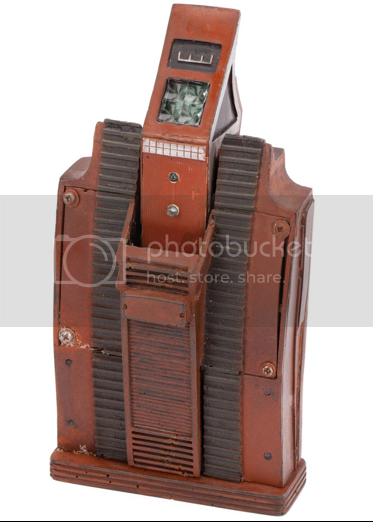 Either way, at $ 1,353 this is fairly priced even if NOT used by Quark. 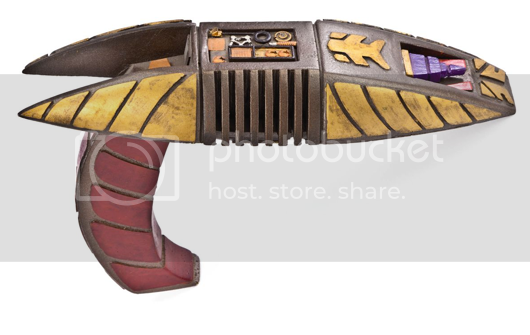 A re-purposed Ferengi Pistol from DS9, this went for a very strong $ 1,968, which I find very high, giving this the worst deal of the auction. But it is only about $ 600 too much, so not that bad. This pistol is missing the barrel cover and I have to give Profiles credit for noting that in the description. None the less, as I mention above, this is another one I have, which goes with my Jem'Hadar costume. At $ 922.50, reasonably priced. Used by a few different alien races, note that it is also the same as the Suliban pistol below. At $ 799.50 you get a decent looking weapon, and I think you don't pay more than this for a generic weapon. $ 600-800 is about right. I liked this one a lot. It lights up and was a primary weapon in "Enterprise". At $ 1,845 it was reasonably priced. 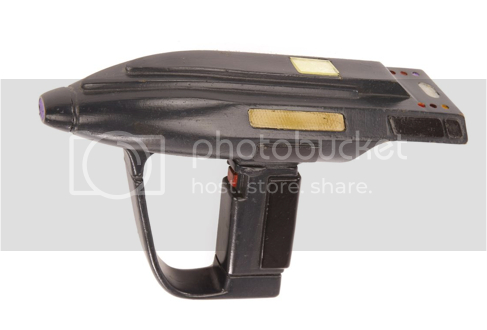 The other Suliban pistol used in "Enterprise" it also lit up and was a good deal at $ 1,230 as it also was a light up version! This was the one used in "Broken Bow". I kind of like the Flash Gordon retro design. Advertised as made as a prototype for Star Trek: Enterprise, Star Trek prop maker extraordinaire Mike Moore from HMS says that it was originally made for Voyager and then submitted later for Enterprise and rejected. Not my style, but a few people bid on it. It went for $ 861. Tomorrow is a review of the rest of the Dreier Auction. 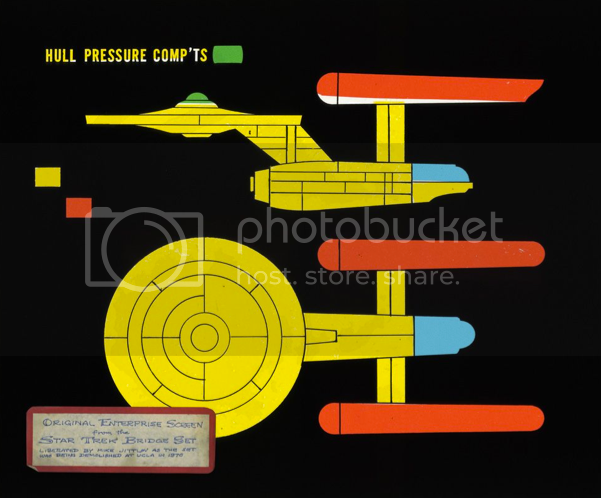 The Dreier Collection auction from Profiles in History was certainly one of the best Star Trek auctions Profiles has brought us in years. Dreier was one of Profiles most prolific buyers and so built a huge collection. He was also a Star Trek fan, especially TNG and so has a great collection of props. I am breaking this post up into two, and then I will review the Profiles Icons of Hollywood Auction.You can also review the auction items on the iCollector site. The TOS Tribble went for $ 3,382.50. 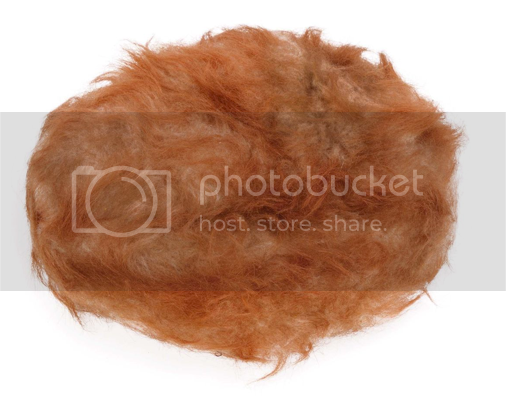 This is HALF of what a TOS Tribble went for in the last Profiles auction ($ 6,755). And this shows an important point. Once an item sells at a high point, the next time a similar item comes up it will have less bidders bidding it up. And in the previous auction, the third bidder didn't bid very high, then in the next auction the under bidder will, if he is still after the piece, will have a lot less competition. This went for $ 2,767.50, which is probably about right for this. Any of these sketches is valuable to a TOS fan, especially those of us who remember them from "The Making of Star Trek" book. Those in the book are certainly more valuable. There has been a lot of bad information about this piece. In fact one individual has claimed to own this piece (Twice!) when he didn't. My next two articles will be about this very piece. But let me say, that assuming the provenance is strong, this piece was the best deal in the auction. But rest assured, the proof will be delivered after my usual exhaustive research. I should be wrapping the whole thing up tomorrow. A pretty good deal at $ 2,767.50. The was what Chekov used through out Star Trek IV. I think a main character movie costume is always a good piece to anchor your collection. The beauty of this piece is the mannequin. It sold for $ 15,990 and probably a fair price based on its displayability. It was a beauty and very well executed. 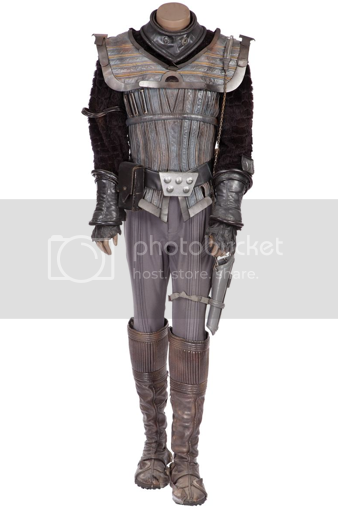 Identified as a feature film costume, and interestingly, with Kruge's boots from Star Trek III (thanks to Don Gaffney for pointing this out). The price of $ 11,685 was high for a Klingon based on previous sales in the $ 6,000-9,000 range. But still, these are enduring valuable pieces that are a hug addition to any collection. This is an interesting piece and went kind of high at $ 4,305. No provenance on this, so I am curious where it is from, but very cool indeed and a great piece for a Riker fan. Would look great next to his jumpsuit. I said this was headed over $ 10,000 and it wound up at $ 13,530. This is certainly the premier Patrick Stewart costume and shows that Captain's costumes remain strong. Notable in how cheap it went at $ 1,045.50. I am surprised that there are so few people after one of these. A good deal. Lot 200 Worf Distressed Costume from "Genesis"
Some people love distressed costumes as they are immediately recognizable and easily screen capped to a particular episode. Yet there was no proof that Michael Dorn ever used this. Now, possibly because it is metal and Michael Dorn probably picked up every metal Bat'Leth made. Still at $ 7,380 I think it is way over priced. Rubber Bat'Leths have sold around $ 1,500, and there are several metal Ba'Leths floating around, so it seems pretty high. Still, one of the truly Iconic props from TNG. 20 Isolinear chips and three holders for $ 9,840? Are you kidding me? WORST BUY of the auction. This is just crazy. Ok, more to come tomorrow. This would be a long post, so I am breaking it up. And make sure you join our Facebook group!